You’re a world traveler. You’ve had thousands of adventures and you’ve loved every minute of it. When it comes to travel, you’ve been around the block, and whether it’s planes, trains, or automobiles, you know everything there is to know about traveling, packing, and convenience, right? 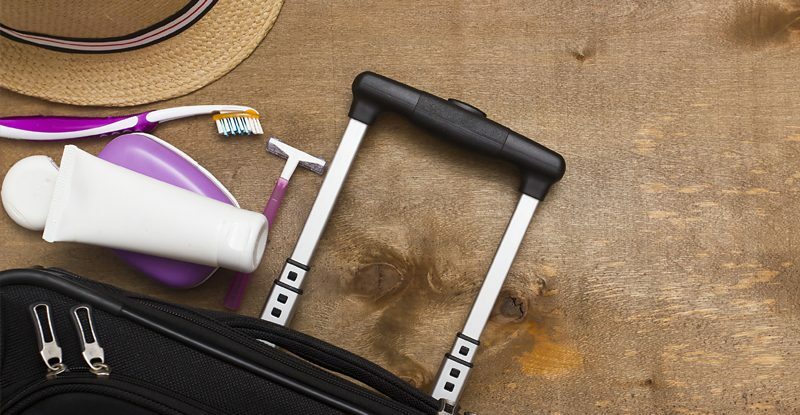 While you might be a seasoned vet, there’s always something new to learn about what to include in your must-have travel accessories, and we’ve laid out some new inclusions in one of the best categories of all – mini travel accessories. Mini accessories are the perfect addition to your go-to travel packing plans because they’re useful, convenient, and of course, mini. Check out this list of things we think you need to have on your list before your next adventure! If it’s a plane you’re taking to your next adventure, then you already know the biggest hassle you’ll have to deal with – the weight restriction at the airport. If you’re immediately having flashbacks to that time you had your suitcase wide open in the airport desperately rearranging to hit the max weight, you’re not alone. But with this mini gadget, you can weigh your suitcase at home before you head to the airport and avoid the humiliation and desperation. This gadget features an easy-to-read LCD display that doesn’t require a battery-draining backlight to read. It’s durable, stainless steel, and won’t add any serious bulk to your bag if you want to include it in your pack. It will weigh up to 110 pounds, the perfect airport-max. Being a brave traveler doesn’t mean you can’t take extra precautions to protect yourself while you’re out exploring, and honestly, being prepared and cautious are two of the best travel-skills you could have! This Door Guard Alarm is a great, lightweight, and mini solution for folks who want a little extra security for when they shut their eyes at night. This alarm is triggered by a sensor that you connect to your door as you sleep and will emit a loud, high-pitched alarm if it’s breached. It’s easy to install, won’t leave a mark when you remove it and also has a long battery life for several uses on your adventures. Sick of those cramped airplane seats? Want to fall asleep in the car (as a passenger) without breaking your neck to fit on someone’s shoulder? Enter the Travelrest Inflatable Travel Pillow. This pillow is one of the only ones on the market that’s both inflatable and provides full lateral support for your entire upper body. You can wear it across your body for the ultimate neck, head, and back comfort. The best part? It’s inflatable, so you can deflate it and fit it in your suitcase, carry-on, or backpack without taking up a ton of room! We try not to use the term genius around here too often, but it’s incredibly difficult not to when you consider this mini travel accessory. Not only does this mini water bottle give you 20 ounces of H20, but it also gives you the most convenient place to store your pills. With a daily organizer attached to the side of this bottle, you’ll never worry about keeping your pills organized, or in a convenient spot, ever again. It’s easy to put together, and despite its rounded appearance, will sit level on a desk or hard surface, so you never have to worry about it tipping over. This device puts your pills and water all in the same place, keeping you on your schedule and never interrupting your travel plans. So, you want to take awesome, Instagram-worthy travel shots but you don’t have the room in your luggage to cart around a giant camera and an amazing, telescopic tripod? No worries! That’s where the Premium Mini Tripod Phone Mount comes in. This little beauty has a universal cell phone and camera stand that will set up anywhere you want! Gone are the days of propping up your phone against a tree to get that perfect shot of you and your crew, now, just pop this mini tripod into your bag, hook up your phone or camera, and get the shot you want! It’s lightweight, ultra-portable, and a great mini accessory to have on hand. Sick of relying on sketchy routers when you travel? We don’t blame you. So, bring your own along! We know what you’re thinking, isn’t that sort of bulky and unnecessary? No way! Not when you have the mini, portable, and super lightweight HooToo Wireless Travel Router. This little guy will provide space for you to back up all the photos and videos you’re taking while you’re on your trip (freeing up your phones and cameras), instantly convert a wired network to a wireless with easy setup, create your own secure wifi connection, and is powered by USB for extreme portability! If you’re a total germaphobe (or just have a healthy appreciation for cleanliness) these mini, to-go ware bamboo travel utensils might be the perfect addition to your must-pack items. These utensils will give you both peace of mind and tons of packing space leftover, so you don’t have to sacrifice germy-eating for space. These utensils are heat resistant, won’t absorb flavors (a godsend when you’re using them for all kinds of foods), are easy to clean, and come with their own packaging to make sure they stay clean during your travels. As much as you love traveling, you know you can’t rely on always getting a great night’s sleep, right? Usually, you’re right. But, with the Alaska Bear Natural Silk Sleep Mask, you can almost guarantee yourself a solid night’s sleep no matter how bright the room, car, or plane. Not only do these bad boys block light like a dream (no pun intended), but they’re also super soft and comfortable. Made out of 19 momme natural mulberry silk on both sides, you’re guaranteed a smooth, comfy slumber.